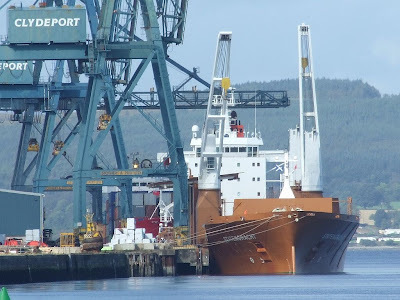 Loading at Greenock today was the Dutch-owned STATENGRACHT, built for Spliethoff by the New Sczcecin Shipyard in Poland, in 2004. Full details of the ship can be found in this PDF file, together with a profile drawing. One of her fleetmates, STADIONGRACHT, is also on the river today, although she is in King George V Dock discharging plywood. STATENGRACHT sailed this evening for Jacksonville.